Designs by Lisa Somerville: Kitchen Sink Stamps - Congrats Grad! Kitchen Sink Stamps - Congrats Grad! Happy Kitchen Sink Monday! With Graduation just a few weeks away, I thought I'd get a head start on some Graduation cards, so I have some on hand. 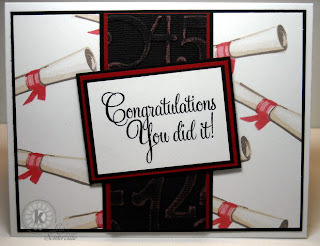 I used the Diploma from Kitchen Sink Stamps 3 Step Graduation to create my background paper. On the Black panel in the center I embossed the Cuttlebug Numbers Folder onto Black Magic Core'dinations, then sanded with a DuraSand Block, this allows the Red Core to show through. The sentiment is from this same set, stamped in Black Archival on White card stock using a SAMJ. Looks like Hallmark's top line to me! Beautiful card! Love it Lisa! What a fun Grad card!! Fantastic grad card, Lisa!! Great design and layout! Another fabulous job using KSS!! 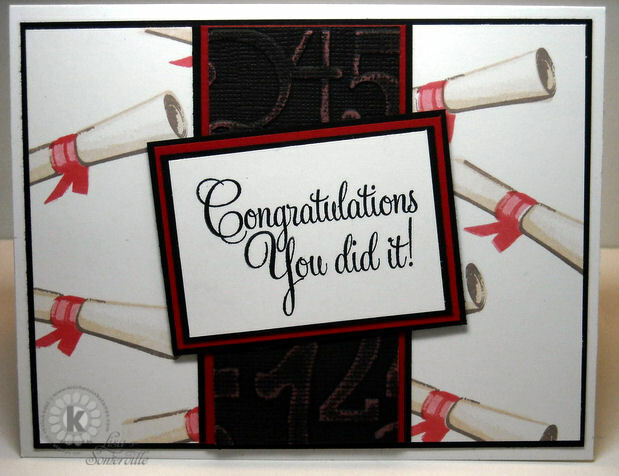 What a wonderful graduation card! Beautiful work, Lisa! Great "DP", Lisa! :) .... and fabulous graduation card!